To me this movie is absolutely magical from go right up to the end. I have watched many movies before but not many of those movies has an impact full opening sequence like this movie has. I have mentioned this before and I will mentioned it again that Vinnaithandi Varuvaya has perhaps the best opening sequence of any tamil movie. Within 6 minutes of the start of the film, the director has explained everything we need to know about the character, the girl he loves is about to get married, he has completed his studies but has left that to pursue his dream to be a director, made friends with the right person to accomplish this dream and has told everyone at home about it and also how he first meet her. The scene at the gate when he first sees her and falls in love was just brilliantly done. The dialogues, the camera work, the cue on music and of cause the expression of the hero, it's just perfection! Many films have shown you love at first time and it's usually crap and you know it, but this is as realistic as it gets. An absolute art to watch. You know if you were in that same position you would have done the same! That is where the genius works his magic. All due credit to Gautham Menon himself who is a specialist in making you feel as if those things had happened to you. He draws from real life inspiration and when he puts it on screen, he does it in a way which makes everyone feel like they have been there, done that before and that allows the audience to connect with the character and travel with them in this journey. Over the course of the film, you don't feel like you are the audience but as if you are the character. You feel their love, you smile to their joy and you cry to their pain. As if all of those moments are happening to you. Hats of Gautham Menon for pulling this off. It feels so real watching every scene. The music was a real threat. When it is AR Rahman, you know you are going to get a musical feast and he delivers it with ease. But what makes the songs connects so well with the film, is the timing where the songs are placed. That credit has to go again to Gautham Menon. A special mention to the dialogues which for me was the key to it's success. The dialogues like "There are many girls in the world, but why did I fall in love with Jessie" and the other dialogues which is in the video above. They were just amazing. Fantastic work in writing the dialogues. Simbu has never been a favorite actor of mine and I doubt he will ever be, but his portrayal of Khartick will perhaps be the most favorite film character of mine. 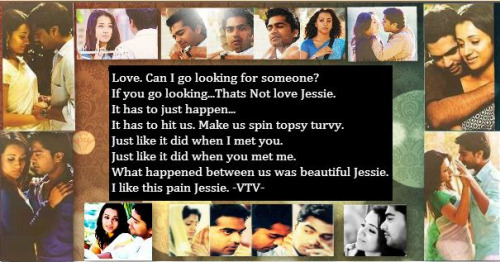 Simbu was perfect for the role and he gave a 10/10 performance in this film. I am glad no other actor played that role in Vinnaithandi Varuvaya except Simbu. He lived the character and it was so real. I can only expect more of that in Acham Enbathu Madamaiyada. Meanwhile Trisha was just wow. There is no need to go on explaining how gorgeous she is, but her performance of a lady who is thorn between the love of her life and her family was excellent. You could feel her internal struggle and her conflicts and how she brought it out on screen was fantastic. The name Jessie would forever be embedded in people's heart. It's for this reasons why I would say Vinnaithandi Varuvaya is a cult film. A film that will never grow old. 20 years from now, youngsters who watch this film would still be able to connect to the film and travel with the characters. This film stands on par with Alaipayuthey and without a shadow of a doubt Gautham Menon is my favorite director. I can't wait for his next with Simbu and I hope it is an extension of the Khartick character in different situations.